It had been the wettest winter in a generation, and 2016 ushered in an unremitting procession of gloomy, damp weekends. But at last in April there was a stirring of sunshine as Mother Nature began to get her finger out, and at last I was able to return to Norfolk to visit some churches. One of them was Hockering. I had long looked forward to coming back here, not least because ten years previously it had provided me with one of the more memorable experiences of my journey around the churches of East Anglia. I returned to the pleasure of a church stunningly cared for, after many years of decay. I had witnessed the start of this TLC some ten years before, when I'd had the privilege of meeting one of the truly great Norfolk eccentrics. But sadly, I came back to discover that he is no longer with us. Back in 2006, I had written: we came to Hockering the morning after the second exorcism. I couldn't honestly say that all was calm. It was a day of sunshine and blizzards, when the light first dazzled and then submitted to a baffling of snowflakes as fat as goose feathers. We church-hopped between the flurries, catching glimpses and seeking shelter. It was a day to battle with obscurity, and as I said to Peter later, it was difficult to know where to start. First of all, perhaps, there was the screaming skull. Or was it the cold spots? There were a lot of cold spots, apparently. But none of that could have happened without the phone call about the SatNav. And then later there were the Saints, and there were the extraordinary Berneys, and there was Catholic treasure from beyond the great divide. Such a lot to remember. Perhaps it's best to start at the beginning. St Michael, Hockering, is a small-scale work of the early 14th century, vigorously enhanced in the late 15th or early 16th century, and then, in part, enthusiastically refurbished by the Victorians in the 1850s, as we shall see. However, it still retains a lot of its decorated charm, and the tower is curious because the buttresses stop short of the later bell stage, making it look like a small head on broad shoulders. The pretty pinnacles and battlements help to alleviate this; a crowning, if you like. 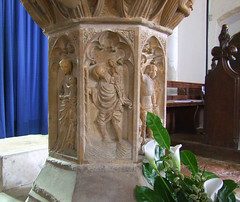 The church sits among fields to the west of the village, and just to the north of the main road from Norwich to the Midlands, which slices clinically through the otherwise profoundly rural landscape of central Norfolk. We were in Peter's car, heading across the A47 to St Michael. The keyholder was in the back. He was in his fifties I suppose, a cheerful man and, as it would turn out, a kindly man. He was heavily bearded, with longish hair, as if he had intended to be on the hippy trail to India, but had ended up in Norfolk instead. He wore a leather jerkin, rubber waders and a pearl earring. We were really grateful that he was giving up his time. He told us about the lot who'd come yesterday. They'd also been grateful. They hadn't known, of course, that if they'd waited a while he'd have been there anyway. He spent hours every day at the church, because he was verger and sexton and handyman and cleaner and silver polisher and carpenter and chief cook and bottlewasher all in one. We hadn't known that either of course, but it didn't matter. Yes, that lot yesterday had been waiting for him when he got there, and he knew straight away it was an exorcism because there'd been an exorcism five years ago, and this was just like that. 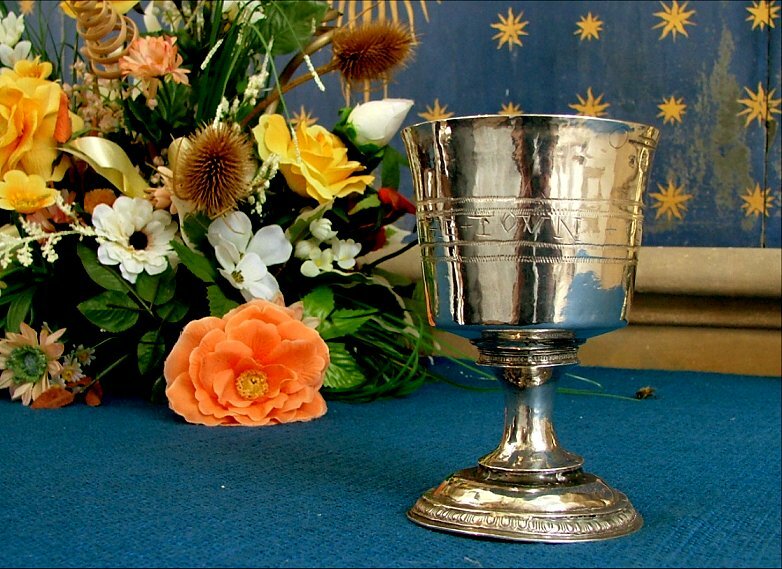 And five years ago funny things had been happening; you'd take the candle stocks off the altar and lock them away, and when you were back out in the nave you'd hear a clatter, and you'd go back to the vestry and find them rolling around on the floor. But now they had this woman with them who could sense evil. She could see it, she could smell it. I was trying very hard not to catch Peter's eye. I feared it might break the spell. 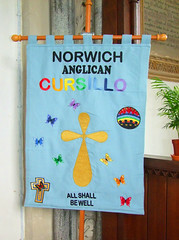 I have now visited nearly 1200 churches in Norfolk and Suffolk, but this was gold dust. I had never heard anything like this before. My mind rolled, and I felt a thrill of excitement. Fifteen minutes earlier, when we'd first arrived at the church, I'd actually been feeling a little low. We'd just been subjected to the flat-lining pulse of Honingham St Andrew, and so to find another locked church was depressing, even though it had a keyholder notice. Through the magic of the OS street atlas of Norfolk we found the house where the keyholder lived; but when I knocked on the door, there was no answer. I waited and waited while Peter turned the car around. The house wasn't far from the church, but it was on the far side of the A47, which no pedestrian crosses safely. And I waited, and I thought to myself, I wonder if there's a key hanging up somewhere? Because some keyholders keep the key hanging up outside for other parishioners to use. And just as I thought I might look for it, the door opened. Within moments, I knew that I was in the presence of one of Norfolk's great eccentrics, which is saying something, because in this day and age the county may well have cornered the market, at least as far as England goes. And before we left Hockering, which would be fully two hours in the future, I would know that, thanks to this friendly, candid man, if any church in Norfolk is to survive the next quarter of a century it will be Hockering. He invited us in to his house while he looked for the key, but what had surprised him was that we had found his house at all. Because that lot yesterday had phoned him up and said they couldn't find his street, and asked him for the post code of the church so they could put it in the SatNav, and then they could let the SatNav direct their car to the church, and he laughed and said there was no need, he'd meet them there, and the church was easy to find because it was the big thing that looked like a church. He'd got to the church, and they were waiting. Three clergyman and a woman who saw things other people couldn't see, felt things they couldn't feel. And she'd wandered around, poking in corners, and she found all these cold spots. 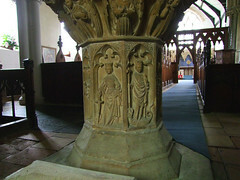 There'd been one in the porch, and one by the font, and several in the vestry. Worst of all, up in the west gallery she'd sensed a screaming skull. That was the motherlode as far as evil was concerned, and the exorcism team sprang into action. I made up my mind that, more than anything, I wanted to go up into the west gallery and sense the screaming skull. 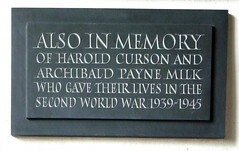 We got to the churchyard, but the porch was out of commission and cordoned off. It wasn't clear if this was due to falling masonry or demonic possession*. Instead, we were let into the chancel, through the Priest's door. Hockering chancel is an opulent 19th century refurbishment quite out of character with the rest of the church. 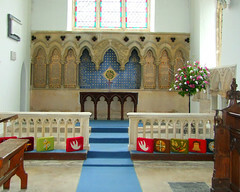 The chancel arch and its matching stone reredos in particular are textbook examples of the international mid-19th century Early English style, familiar to church explorers from Vancouver to Calcutta and beyond. The arch in particular must have cost a fortune. Fortunately, the Victorians used the old bench ends for the stalls, or perhaps they had simply run out of money by then. Certainly, the 1890s rood screen does not match the stonework for quality. 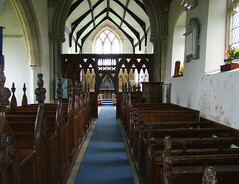 However, west of the chancel arch is a small nave with a north aisle, and it is full of local character, with an air of the centuries conspiring, through a mixture of care and neglect, to leave us something unique. 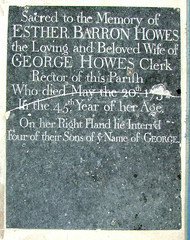 And best of all is Hockering's wonderful font. It sits beneath the George III royal arms on the front of the west gallery, and it soon distracted me from searching for skulls. The bowl is Victorian and perfunctory; the shaft is medieval, and wonderful. 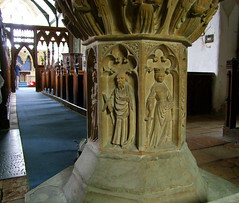 It depicts eight Saints, standing in niches. 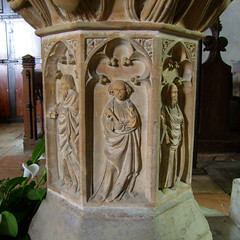 Their heads were whacked off by 16th century protestants, and have since been replaced, but they are in the main in good condition, beautifully clear and identifiable. 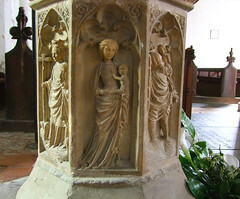 They include St Michael, St Andrew, St Margaret, St Catherine, St Christopher and the Blessed Virgin and child. It has to be said that the interior of St Michael is slightly ramshackle, though pleasantly so**. It is, however, very clean. This is because the keyholder has been systematically working his way through the building, cleaning and sealing dusty surfaces, polishing the wood and scraping the muck off the stone. So far, it has taken him almost two years of daily work, and he still isn't quite finished. Now, England is full of people who love their parish church, but it is rare to meet someone who so wholeheartedly backs up this love with the sheer sweat of his brow, and I admired what he was doing here immensely. 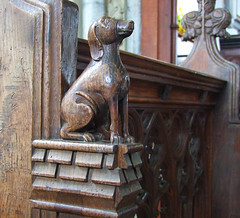 The majority of the benches in the nave are late medieval, with simple, carved poppyheads. 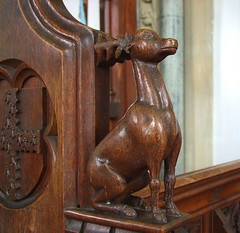 At the front, a box pew bears the arms of the Berney family, who are one of the long-established stars in the firmament of Norfolk landowners. By the 13th and 14th centuries they were busy organising the peasantry in these parts, as well as elsewhere in Norfolk. Incredibly, they still live at Hockering Hall, the current incarnation of which is a modernist building of the 1950s. 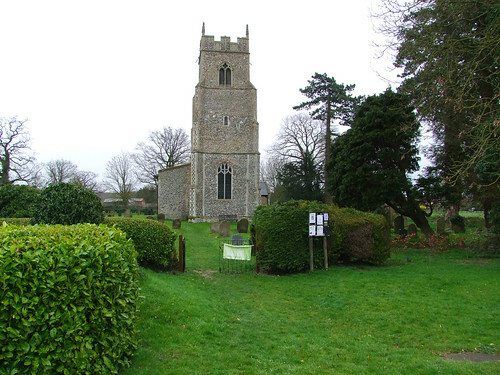 And St Michael, which is by no means one of Norfolk's more significant churches, is still their church, and their patronage still falls heavily here. The current family attend the church every Sunday, and they form a significant proportion of the tiny congregation. I thought that this was wonderful, like something out of an Evelyn Waugh novel. 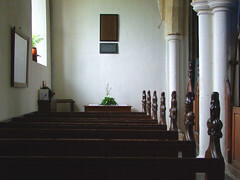 Apparently, it is still the job of the churchwarden to make sure that nobody else sits in the Berney pew. A few months back, someone they hadn't seen before arrived early for the evening service, and sat down in it. There was a collective sharp intake of breath from the half dozen or so locals sitting behind, and the stranger had to be turfed out and rehoused in the cheaper seats. 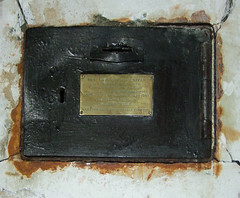 Mortlock, visiting in the early 1980s, said that there was an air here of a church not being forgotten, but not cherished either. He'd probably say the same today, but I think this is simply because of the junkshop atmosphere of a quirky church with much of interest and more than a little rustic character**. Typical of the quirkiness is the brass to Humphrey Smallpece,it reads Milleno, Quingenteno Anno ter quique deno et nono Domini, dum Rex Henricus et annum primum post deno tres regni Octavus agebat, Hic evit Humpfridus Smallpece aestate sepultus. This translates as 'In the summer of the year 1539, as King Henry VIII began the 31st year of his reign, Humphrey Smallpece died, and was buried here'. This is curious, because it means that here we have an inscription from the very earliest stages of the English Reformation, when England was still a Catholic country, and yet it is entirely secular. At last, we went up into the gallery. It has been built into the splay of the west window, and is approached via the tower stairs, but it is too rickety to be used by the public anymore***. It is cluttered with equipment - a lawnmower, planters, and old books under a carpet of dust. No screaming skulls, though. The keyholder could see in our faces that we thought it untidy, and he laughed. "This is what the rest of the church used to be like", he observed. Finally, something genuinely extraordinary. 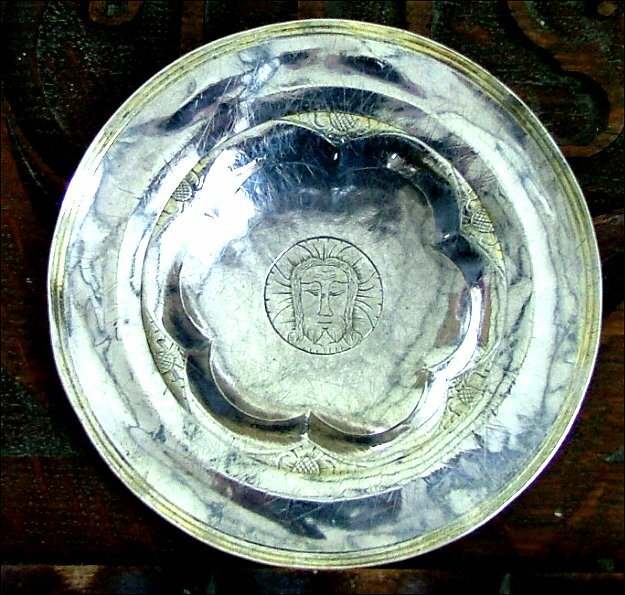 Hockering parish possesses some 16th century plate, including an exquisite silver paten with the head of Christ in the centre. This can be dated accurately from a will bequest of 1520. 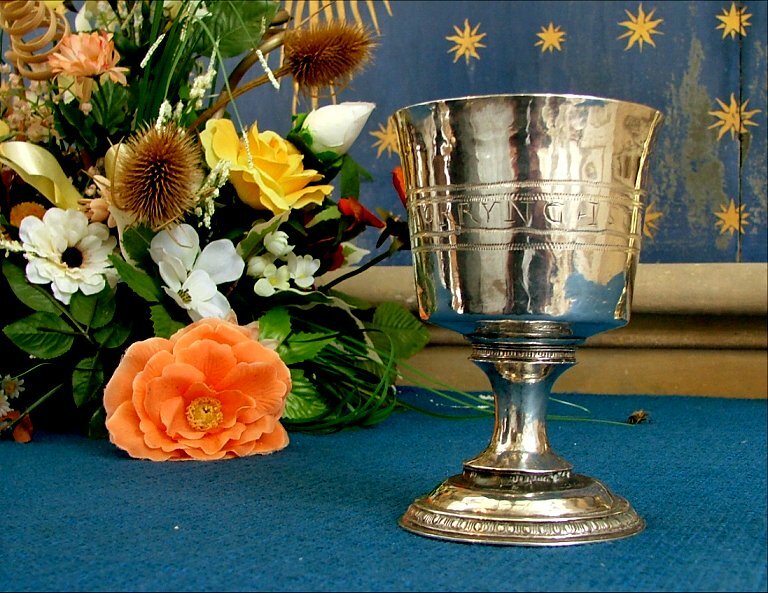 There is also a cup of 1570, post-Reformation of course, bearing the inscription HOKRYNG TOWN. 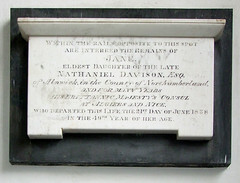 These are now kept in safe storage in Norwich, not at the church, but they had recently been returned to the parish from an exhibition, and were due to go back to Norwich later that afternoon. Our friendly keyholder produced them with a flourish for us to look at and photograph - tremendous treasures from a world ago, now rarely exposed to the light of day. and wondered to myself if, when I came to write about Hockering, I should mention the exorcists. The thing is, I get an increasing number of crank e-mails from people claiming to represent organisations with wacky names like the Suffolk Paranormal Society, and the North Essex Ghost Hunters. They ask me if I know of any haunted churches for them to investigate. My answer, in the days when I still bothered to answer them, was no, of course I don't. How on earth could a functioning, welcoming, prayerful church possibly be haunted? I fear they may now and try and get their talons into Hockering, and it will be partly my fault. 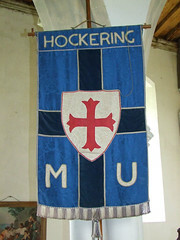 All I can say is that there are now no ghosts at Hockering, and I don't believe that there ever were. 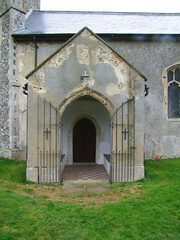 * The porch has since been beautifully restored. ** This is no longer the case, the church is immaculate inside. *** The gallery is no longer accessible.